Set in occupied France during World War II, the novel centers on a blind French girl and a German boy whose paths eventually cross. In 1934, 6-year-old Marie-Laure LeBlanc is the daughter of a widowed master locksmith at the Museum of Natural History in Paris, and she often accompanies him to work. Marie suffers from rapidly deteriorating eyesight secondary to juvenile cataracts, and becomes fully blind at the age of 6. Her father Daniel enriches her environment, crafting a wooden scale-model of their actual neighborhood and supervising her so that she is eventually able to navigate independently. He uses her birthday as an opportunity to develop her sense of touch, providing increasingly intricate puzzle boxes for her to solve every year. He also provides new novels in Braille to read. She becomes entranced by the imagined worlds like those that she explores in her edition of Jules Verne's Twenty Thousand Leagues Under the Sea. The museum is rumored to house the Sea of Flames, an exquisite blue diamond of immeasurable value with beautiful dancing "red flames" at its center. According to legend, however, the diamond is cursed: whoever keeps the Sea of Flames cannot die, but their loved ones will be stricken with unending misfortunes. Allegedly, the only way to end the curse is to return the stone to the sea, its rightful owner. Meanwhile, in Germany, 8-year-old Werner Pfennig is an orphan in the coal-mining town of Zollverein. He and his sister Jutta find a broken short-wave radio behind the children's home where they live. Werner manages to repair the radio, and his natural skill for circuitry becomes apparent. He and Jutta tune in and listen to a variety of programs, including a regular broadcast from France hosted by an older gentleman who shares stories about the world of science, skillfully framed so that even younger listeners can understand. When Germany invades France in 1940, Marie-Laure and her father flee to the coastal town of Saint-Malo to take refuge with her great-uncle Etienne, a recluse suffering shell-shock from the Great War. Etienne spends all his days indoors but reveals to Marie-Laure that he and his deceased brother Henri used to broadcast science lessons to children from a large radio inside the chimney. Unbeknownst to Marie-Laure, her father has been entrusted with the Sea of Flames or one of three exact copies. The four jewels look very much alike, although three are worthless fakes. As a diversion, each of the four is given to a different protector, none of whom knows whether his stone is the real priceless gem or the look-alike fake. Each protector is charged with keeping his jewel out of the Germans' hands. Daniel conceals his stone in a small wooden replica of Etienne's house, a removable puzzle box which fits within the city model he makes of Saint-Malo. This model is placed at the foot of Marie-Laure's bed, where she spends hours learning the new town with her fingers before finally venturing out. Daniel, who has been noticed drawing buildings and measuring distances in the town, is arrested by the Germans on suspicion of espionage and disappears into the Nazi prison camp system, leaving Marie-Laure alone with Etienne and Madame Manec, Etienne's longtime maid and housekeeper. Soon, a Nazi gemologist, Sergeant Major Reinhold von Rumpel, is tasked with evaluating confiscated jewels and eventually sets out on the trail of the Sea of Flames. He has a malignant tumor and becomes ill during his search, which he continues while enduring treatment and the ravages of the relapse. He finds his way to the Natural History Museum and learns that duplicate gems have been made. He traces each of the fakes, eventually arriving in Saint-Malo, where the real gemstone is hidden. He learns about the legend of immortality that is bestowed by the jewel, and although he does not fully believe it, he clings to a hope that it might after all be true and that possession of the real jewel might save him from the growing tumors. Meanwhile, Madame Manec participates in the Resistance along with other local women. These activities have some success, but Madame Manec becomes ill and unable to participate, and later succumbs to the illness. With Marie-Laure's father imprisoned, and Etienne unable to go outdoors, Marie-Laure begins to make trips to the bakery store to collect notes hidden within bread loaves, containing information about German troop positions that Etienne broadcasts from his radio. Werner's passion for science and his gift for radio mechanics earn him a place at the National Political Institute of Education at Schulpforta, a nightmarish training school for the Nazi military elite where, he is told, "You will all surge in the same direction at the same pace toward the same cause. ... You will eat country and breathe nation." Werner obeys, and his discipline and scientific aptitude carry him into the Wehrmacht, where he proves adept at tracing illegal radio transmissions. Werner works with Volkheimer, a large soldier also from Schulpforta. As time passes, Werner is increasingly sickened by what he sees, particularly when a young girl is killed after he tracks a radio signal to its source. He is also haunted by his memories of the Frenchman's broadcasts, which remind him of a time when science seemed an instrument of wonder, not death. Werner's and Marie-Laure's paths converge in 1944, when Allied forces have landed on the beaches of Normandy, and Werner's unit is dispatched to Saint-Malo to trace and destroy the sender of mysterious intelligence broadcasts. Werner tracks the transmissions to Etienne's house but ultimately allows the broadcasts to continue when he sees Marie-Laure. As the Allied forces lay siege to Saint-Malo, Werner is trapped beneath a pile of rubble. At the same time, Marie-Laure opens the model of Etienne's house and finds the diamond. Werner escapes and heads for Etienne's house, where he finds von Rumpel in pursuit of the jewel. After a brief standoff, he kills von Rumpel and meets Marie-Laure, who had hidden in the attic. Although only together for a short time, they form a strong bond. As they flee from Saint-Malo, Marie-Laure places the Sea of Flames inside a gated grotto flooded with seawater from the tide, returning it to the ocean. Werner sends Marie-Laure away into safety but is captured and sent to an American disarmament center where he becomes gravely ill. Just as he begins to recover, he accidentally steps on a German landmine at night in a fit of delirium and is immediately killed. Thirty years later, Volkheimer finds Jutta and gives her Werner's belongings at the time of his death, including the model house which contained the Sea of Flames. Jutta travels to France with her son Max, where she meets Marie-Laure in Paris, now working as a marine biologist at the Museum of Natural History. Marie-Laure opens the model and finds the key to the grotto. The story ends in 2014 with Marie-Laure, now 86 years old, walking with her grandson in the streets of Paris where she grew up. All the Light We Cannot See was received mostly positively by critics. William T. Vollmann, writing for The New York Times Book Review, praised the novel's writing style and the character development of Marie-Laure, whom he calls "an exquisitely realized creation", but he criticized stereotyping of Nazism, particularly the perceived one-dimensionality of Frederick and von Rumpel. Carmen Callil, by contrast, wrote that "[t]he chapters on Werner's schooling ... are the best in the book" in a review for The Guardian. Although applauding Doerr's attention to detail, she considers the novel too long and the dialogue too American. In a review in The Boston Globe, John Freeman praises Doerr's work, calling his language "fresh" and noting how "he allows simple details to say much". Amanda Vaill, in a Washington Post review, admires how the book is "[e]nthrallingly told, beautifully written and so emotionally plangent that some passages bring tears, [but] it is completely unsentimental." She writes, "Every piece of backstory reveals information that charges the emerging narrative with significance, until at last the puzzle-box of the plot slides open to reveal the treasure hidden inside." The novel spent 130 consecutive weeks on The New York Times Best Seller list for hardcover fiction. The New York Times also named it one of its 10 best books of the year. The novel was shortlisted for the National Book Award. Sales tripled the week after it lost to Redeployment by Phil Klay. The novel won the 2015 Pulitzer Prize for Fiction and the 2015 Andrew Carnegie Medal for Excellence in Fiction. The novel was runner-up for the 2015 Dayton Literary Peace Prize for Fiction and won the 2015 Ohioana Library Association Book Award for Fiction. ^ Busch, Alison. "All the Light We Cannot See: Top Destinations From the Novel". Auto Europe Travel Blog. Archived from the original on 17 May 2015. Retrieved 20 May 2015. ^ Vollmann, William T. (May 8, 2014). "Darkness Visible". The New York Times Book Review. Archived from the original on March 13, 2018. Retrieved June 18, 2018. ^ Callil, Carmen (May 17, 2014). "All the Light We Cannot See by Anthony Doerr review – a story of morality, science and Nazi occupation". The Guardian. Archived from the original on April 22, 2015. Retrieved June 18, 2018. ^ Freeman, John (May 3, 2014). "'All the Light We Cannot See' by Anthony Doerr". The Boston Globe. Archived from the original on June 28, 2017. Retrieved June 18, 2018. ^ Vaill, Amanda (May 5, 2014). "'All the Light We Cannot See,' by Anthony Doerr". The Washington Post. Archived from the original on December 21, 2016. Retrieved June 18, 2018. ^ "Hardcover Fiction Books - Best Sellers - November 27, 2016 - The New York Times". Archived from the original on May 25, 2018. Retrieved 2018-05-24. ^ "The 10 Best Books of 2014". The New York Times. December 4, 2014. ISSN 0362-4331. Archived from the original on September 23, 2015. Retrieved September 26, 2015. ^ Alex Shephard (October 15, 2014). "National Book Awards shortlists announced". Melville House Publishing. Archived from the original on October 20, 2014. Retrieved October 15, 2014. ^ Alter, Alexandra (December 26, 2014). 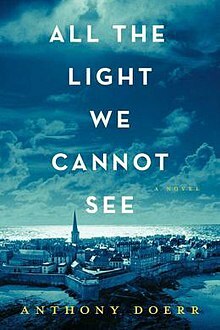 "Anthony's Doerr's 'All the Light We Cannot See' Hits It Big". The New York Times. ISSN 0362-4331. Archived from the original on October 1, 2015. Retrieved September 26, 2015. ^ Flood, Alison (April 21, 2015). "Pulitzer prize for fiction goes to All the Light We Cannot See". The Guardian. Guardian News & Media. Archived from the original on April 22, 2015. Retrieved April 21, 2015. ^ "Anthony Doerr wins Carnegie Medal for fiction". Midcontinent Communications. Associated Press. June 28, 2015. Archived from the original on September 24, 2015. Retrieved June 28, 2015. ^ "'All the Light We Cannot See,' 'Just Mercy: A Story of Justice and Redemption' win 2015 Andrew Carnegie Medals for Excellence in Fiction and Nonfiction | News and Press Center". www.ala.org. July 1, 2015. Archived from the original on October 6, 2015. Retrieved September 26, 2015. ^ D. Verne Morland. "Dayton Literary Peace Prize – Anthony Doerr, 2015 Fiction Runner-Up". daytonliterarypeaceprize.org. Archived from the original on 2015-12-08. This page was last edited on 6 April 2019, at 02:19 (UTC).